PORTLAND, Maine (AP) - When life gives you lemons, make lemonade. When life gives you snow, make snowballs. That's the approach many Northeasterners are taking toward one of the most brutal winters in years. They're staging flash-mob snowball fights, making believe they're at the beach and creating public art with nature's icy medium - all in the name of a reprieve from a deadening routine of shoveling, tough commutes and general battening down of the hatches. "We're about to go stir-crazy with another foot of snow, so I think it's time to leave home," said 35-year-old Molly Bryant Roberts, an L.L. Bean employee from Portland who reveled Wednesday in a word-of-Facebook snowball fight in Deering Oaks Park. "You've got to do something," she said. "It's Maine in the wintertime." A frozen faceoff after a storm last month drew more than 90 people to the park. The group that showed up Wednesday as a huge winter storm spread into New England was more modest - fewer than 10, probably because the weather made travel treacherous - but the spirit was just as big. "Why not do something fun?" 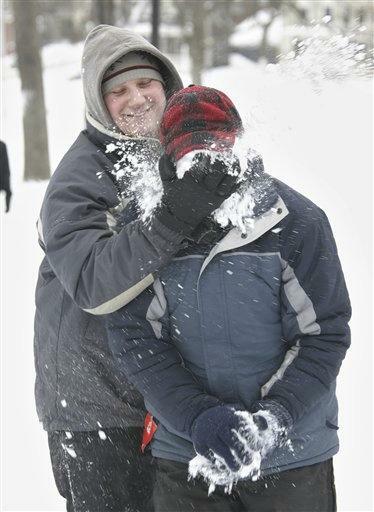 said high school teacher Ross Kearney, 29, hurling snowballs at friends. In Rindge, N.H., the director of campus recreation at Franklin Pierce University has put together a winter recreation program aimed at helping students get out of the dorms to beat the winter doldrums. A sweeping hillside in front of the college president's office gets turned into a park where snowboarders can pull stunts on rails donated by a ski resort. Students go "snow-kiting," where they are pulled behind a kite across a frozen lake on campus while on skis or snowboards. The school sends students on weekly bus trips around New England for skiing, hiking and other outdoor fun. It also holds an annual "Cure for Cabin Fever" event in February, turning an indoor venue into an all-night party. This year, partygoers will find the building filled with beach sand, palm trees and beach volleyball courts. In Providence, R.I., a theater company is trying to bewitch couch potatoes with discounted tickets to an upcoming production of "The Crucible," describing it as a "cure for cabin fever" amid all the snow. "At first it was expected, even a little charming," Trinity Repertory Company said in a news release. "But Trinity Rep is just as tired of being as snowed in as you are." In Waterbury, Conn., auto shop worker Harold Figueroa has taken to turning piles of snow on city streets into works of art. It began about two months ago when the 44-year-old aspiring artist looked at a snow bank and saw what looked to him like the mouth of a turtle. With a little carving and spray painting, it was transformed. "When I do my artwork and people see my creative work ... it makes me happy," Figueroa said. "I want people to enjoy happiness." So far this winter, that happiness includes a snow monkey, a New England Patriots sign and a replica of a Honda Civic - complete with real tires and rims. Associated Press writers Holly Ramer in Concord, N.H., and David Collins in Hartford, Conn., contributed to this report.